The FedEx Express pit crew that is usually seen pitting for Denny Hamlin on race days was in their own spotlight on Thursday night during the All Star Weekend pit crew challenge. The team looked to be business as usual as they went for their 3rd win in 3 years. 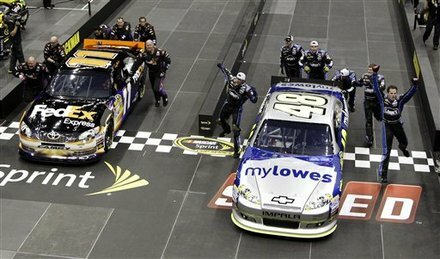 They found themselves in a very familiar position during the finals competing against Jimmie Johnson’s 48 team for the top spot. This year though the 48 team would outperform them and take the their 3 peat away. The FedEx team was still very strong and proved that they’re a pit crew to contend with week in and week out.